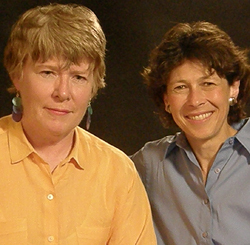 Cathy Gillespie (left) and partner Deb Shore are active in a variety of gay organizations. Gillespie is on the board of Center on Halsted. Shore, an environmental writer and activist, became the first open lesbian elected to countywide office in Illinois, as a commissioner for the Cook County Metropolitan Water Reclamation District.